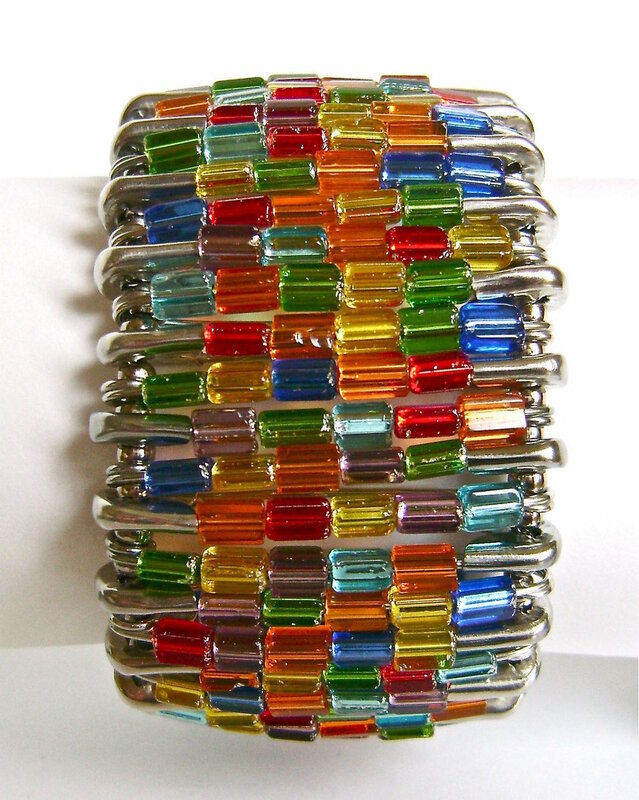 A mix of colorful Czech glass beads come together to create this sparkling cuff bracelet, and it’s all created with safety pins! Yes, safety pins. So easy to make you can do it while you watch TV. Thread beads on open pins then string stretchy cord through the tops and bottoms with a small silver bead separating each pin. This glass masterpiece measures a generous 1.5” wide. The perfect piece to slip on when you just can’t decide what color bracelet to wear. step 1 - Open 50 safety pins and thread 5 beads onto each. Change the order of the colors as you add them to create a variety of color patterns. Close the pins. step 2 - Pins will be aligned on the bracelet with opposite ends together so line them up on your work surface that way. Alternate a pin head with a pin tail throughout. Notice the color placement. If you aren’t happy with it, now is the time to make changes. Your first and last pin should be head to tail also. step 3 - Cut two eight inch long pieces of stretch cord. step 4 - Thread the first piece of cord through the top of all the pins. Do this by first adding a silver bead then moving the cord through a pin and adding silver beads between each pin. Do not add a bead after the last pin. Thread the second piece of cord through the bottom of all the pins in the same manner. step 5 - Turn your work with the right side against the work surface and tie the ends of the top cords together. step 6 - Pull snugly and make three knots in the cord. Dot the knots with Krazy glue for reinforcement. Step 7 - Tie the bottom cord ends together in the same way. When the glue is dry, trim the cords close to the knots and turn your new bracelet right side out. This bracelet measures 6.25” around. If your wrist is bigger, you will need to add more pins and beads. The bracelet should not squeeze the wrist but rather encircle it. If the bracelet is too tight on the wrist, the excessive and repeated stretching of the cord to get it on and off will cause it to lose it’s elasticity more quickly.